Matte light blue graduation gowns are a graceful way to go. Light blue gowns are typically worn by those graduating in the field of education but is also the choice of many schools across the nation. You have spent year after year, giving your best efforts day in and day out to successfully reach this point. Your graduation is coming up quick which means it's time to celebrate! As your friends and family come together to show you how proud they are and honor you on this monumental day, be sure to take a moment for yourself and let it all sink in. Your graduation symbolizes the triumphant completion of this chapter in your life and the very beginning of a whole new adventure. It took countless hours of hard work to make it this far, I'm sure you were forced to overcome a great number of challenges. Undoubtedly you managed to create a lasting friendship or two along the way to help you through your struggles. As you attend your ceremony and accept your degree or diploma, remember that you can achieve your dreams if you are willing to work for it and never give up. At the time of their ceremony, graduating students wear a gown and cap typically with a tassel or graduation cords, each representing various degrees, special achievements, and to show school spirit. Our Cap & Gown + Tassel deal has the basic necessities you'll need to get you ready for graduation, including your robe, matching cap, and a free tassel of your color choice! You can also purchase each of your items separately as well. Anytime you buy a graduation cap from us we will throw in the tassel you select at no additional cost to you. We have a large variety of gown sizes, ranging from 24-66 including several plus sizes. Each color of our matte graduation gowns is also available in a shiny finish as well. 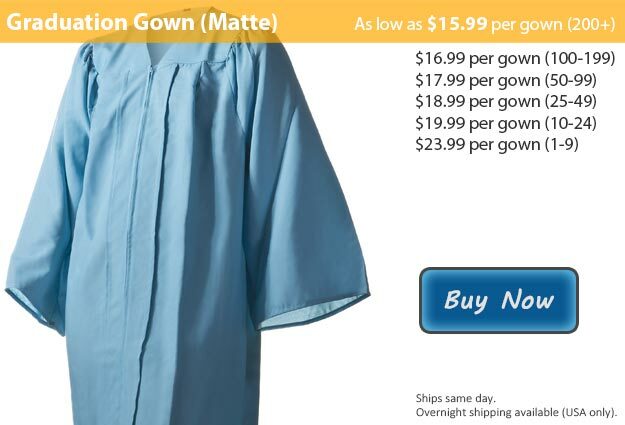 This graduation gown is also available in Light Blue Shiny Fabric.